Wood pellets burn CO2 neutral i.e. they only emit the CO2 which they have actually absorbed during growth. In doing so pellets combat the greenhouse effect and render a valuable contribution to relieving the environment; something which one cannot claim for heating oil and natural gas. For example, 1 litre of heating oil for example contains approx. 2.9 kg of the climate damaging CO2. The annual environmental damage caused by the extraction and primarily through the transportation of oil is enormous. Important factors for the environmental compatibility of the pellet heating system are the source of the raw material, the carbon footprint as well as pollutant emissions. 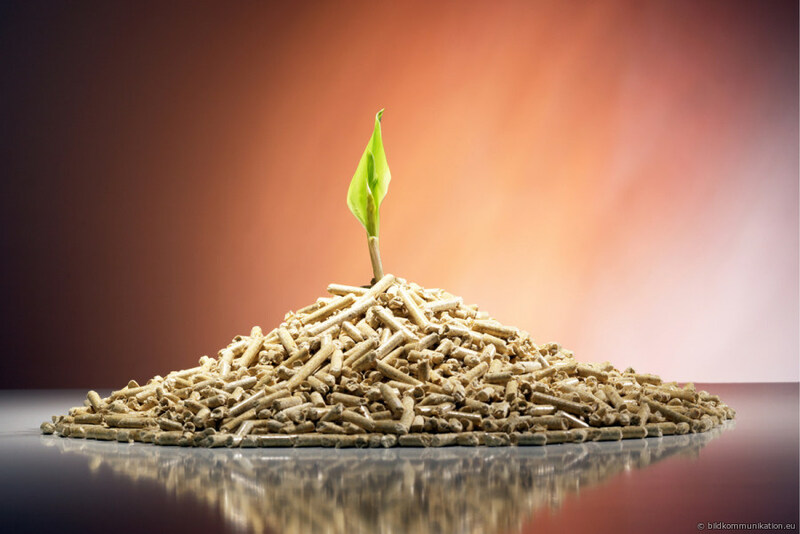 Since the pellets consist of the renewable resource wood, the carbon footprint is considerably more favourable than that of heating systems using fossil fuels. The emissions of particulate matter or fine dust of modern pellet heating systems are above those of comparable oil or gas heating systems; however they are still way below the applicable limits. The replacement of old heating systems with modern pellet heating systems results in a significant reduction in airborne pollutants. Replacing an old solid fuel heating boiler operated with wood or coal, the emissions are reduced by a remarkable 95% when a pellet heating system is installed. According to a study by GEMIS (Global Emission Model for Integrated Systems, www.gemis.de) the emission of SO2 over the total lifecycle of pellets from the recovery of residual wood is around 0.53 g/kWh. For heating oil using condensing technology the value is 0.73 g/kWh and for natural gas 0.18 g/kWh. Pellets produced to conform with the requirements of the applicable standards DIN plus or ÖNORM M 7135 have a sulphur content of maximum 0.04 weight %. The quantity of CO2 which is emitted when burning pellets is exactly equal to the amount of CO2 which would be released by rotting of the wood. Thus, looked at in this way, burning pellets is CO2 neutral. When taking into consideration the emission of CO2 through transportation of the raw wood, forestry management, preparation, transportation and plant creation, the ecological balance for CO2 is not quite neutral. GEMIS shows an expenditure of non-renewable energy of approx. 13% of the useful energy for the complete lifecycle of pellets incl. input of material and transportation. The total CO2 equivalent emitted is stated to be 35g/kWh. The comparable value of fossil fuels is approx. 8 or 10 times higher. Heating oil (using condensing technology) reaches a remarkable 346 g/kWh and natural gas 297 g/kWh. For modern pellet heating systems the emission of fine dust is approx. 8 mg per MJ heat quantity equivalent to 29 mg/kWh. In the meantime pellet heating systems have been developed which by means of optimized combustion can undercut the specified emission limits and can also be installed where tighter specifications are applicable. Such heating systems operate with condensing technology and have relatively dust and soot free flue gases (approx. 4 mg fine dust per MJ). By comparison, the fine dust emissions for single stoves (fireplaces, tiled stoves) are approx. 150 mg/MJ and for wood-burning boilers approx. 90 mg/MJ.